This solar fountain comes with built-in battery, which meanes it can store electricity while working. When cloudy or sunlight become weak , it still works. 1.Please make sure the solar panel is under bright and unblocked sunlight. 2.Water should at least 1 inch (2.5 cm) deep and clean. 3.Clean the container and the pump regularly. Too much dirt may block to pump. 4.Do not use the fountain in dirty or corrosive water. Change the water regularly. 【Build-in battery solar water pump&Detachable washable water pump】 works in cloudy or when sunlight becoming weak. 【4 kinds of different spray heads】The package contains 4 different spray heads, each spray head has a different spray. You can easily change the spray head. 【Built-in water level monitoring system】 when the basin is out of water, it can automatically stop working. 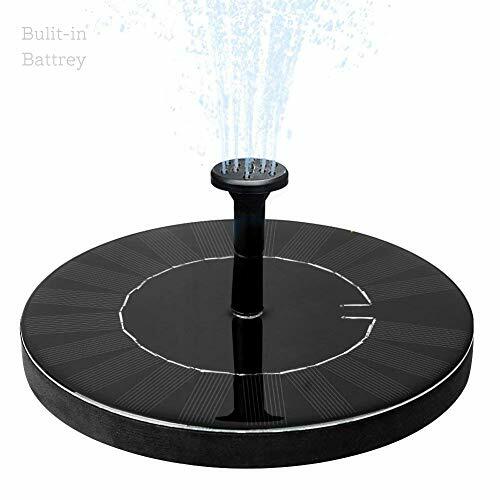 【Applicable for Various Occasions】 Solar fountain for bird bath, fish tank, small pond, garden decoration, water circulation for oxygen. If you have any questions about this product by ROADTEC, contact us by completing and submitting the form below. If you are looking for a specif part number, please include it with your message.